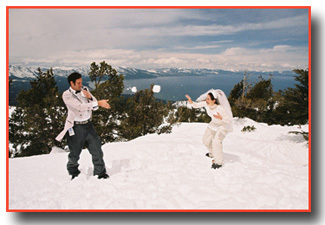 A Heavenly Mountain Ski Resort wedding is a unique way to begin your marriage. The bride and groom and guests will ski to a sheltered area on one of the resorts peaks where your ceremony will take place. The predetermined wedding site is just off the ski trail that presents an unimaginable backdrop for your special occasion. 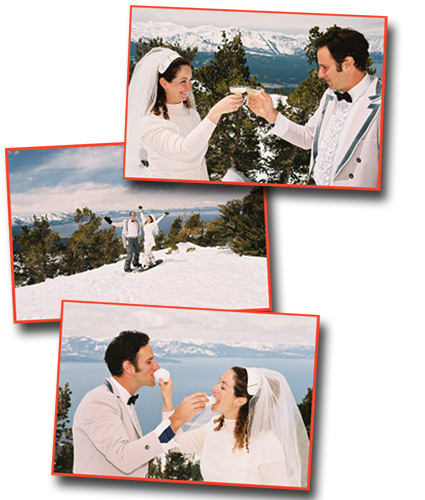 The panoramic views of Lake Tahoe and the Sierra Nevada Mountain Range create an exceptional setting for the photography session, producing dazzling photos that will amaze you. Lift tickets are included with all ski packages, so you may ski the balance of your wedding day if you choose. The resort has nearly 5,000 acres of terrain with over 30 lifts that can take you virtually anywhere in the mountainous regions of the resort’s topography. Once you begin exploring the multitudes of accessible ski trails, you’ll find many other overlooks of Lake Tahoe and Carson Valley offering spectacular sights and a plethora of brilliant photographic opportunities. Ski package includes four lift tickets – one each for the bride, groom, minister, and photographer. Additional lift tickets for guests can be obtained on the day of the wedding and will cost approximately $130 each (price is subject to change and may vary). Recommended group size is up to 15 people.